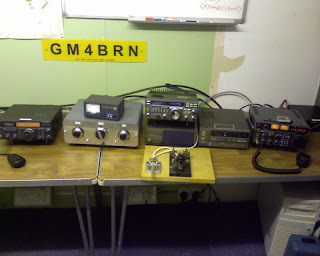 As mentioned in one of the previous posts, Fordell are pleased to welcome along the local Kingdom Amateur Radio Society (KARS) who are using one of the old static caravans near the reception area for their club meetings. The club was only formed at the beginning of the year but has quite a few members already and looks set to be very popular locally. 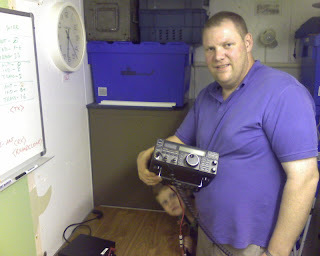 The club are keen to get involved with visitors to the site and are in the process of setting up various activities which will let groups learn about and use the radio equipment in a fun way (eg a 'tracker' game which will let groups track each other around the site in a number of ways). 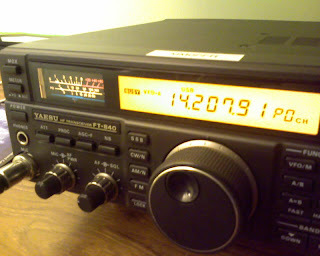 The first big event of course will be the worldwide Jamboree On The Air (JOTA) next month - and more information can be found on the club's website here. 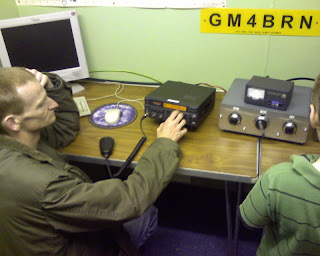 Above : Desperately trying to tune in to Radio Scotland to find out the result of the Cowdenbeath game. Above : According to legend, the old caravan is haunted by the ghost of a curious little boy who occasionally appears during the evening. The club's arrival has also been warmly welcomed by the volunteer staff, who quickly spotted an opportunity to sort a longstanding problem. For quite some time now the TV in the staffhut has had terrible reception, despite the best efforts of numerous good-meaning members to fiddle about with it. Up till now, socialising tended to be rather frustrating as the TV tended to cut out every few seconds (usually during something good but often during X Factor or Scotsport which was a welcome relief) and there appeared to be a strange connection between the signal strength and the number of cars parked outside. 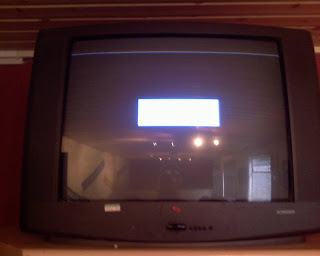 Above : Typical staffhut TV picture prior to help from the radio club. Luckily last weekend a crack team of aerial experts popped up to have a look at the situation and within a mere hour or so had installed a new aerial and wiring and tuned everything up for a great picture. The old aerial (a sad looking thing, which was found pointing in completely the wrong direction from the local transmitters) was sadly confined to the bin after many years of mediocre service. Many thanks to KARS for their help, which is sure to be appreciated by the staff on the dark winter evenings to come. 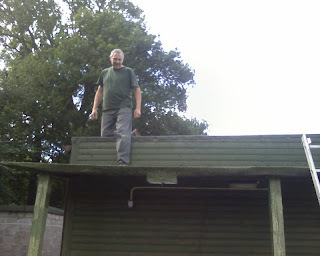 Above : After retiring as SHQ quartermaster, Pete was offered the position of honorary chimney on the renovated staffhut, which he gratefully accepted. 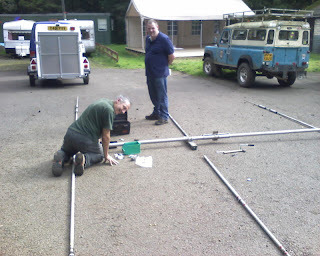 Above : Making sure the big aerial is in good order before next month's JOTA. Anyway, that's all for now - there should be a normal weekend update very soon, and more news from the JOTA event next month which should be pretty popular with local groups and site visitors going by the interest so far.